The cult stories of Eric and Gripper set in a Wiltshire village were broadcast on UK BBC Radio 1’s Weekend Breakfast and Weekend Mid Mornings between 1994 and 1997. Referenced in a Divine Comedy song, “Eric The Gardener” in 1998, Eric and Gripper were surprising and subversive interludes in the BBC Radio 1 pop sequence format of the time. Eric’s dog, Gripper would bark to be let out – just when the story got interesting – breaking the tale into two sections, allowing presenter Kevin Greening to play a song in the gap. Most of the 125 stories – written and performed by Andrew McGibbon – will all be available for download. There will be four new Eric and Gripper stories added every fortnight. © 1994 and 2013 Curtains For Radio Ltd and Andrew McGibbon. 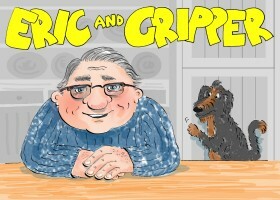 Eric and Gripper stories and recordings are the property of Curtains For Radio Ltd.